Nagano is the capital of its prefecture in a mountainous area of central Japan, which has become world famous after having hosted the Winter Olympics in 1998. 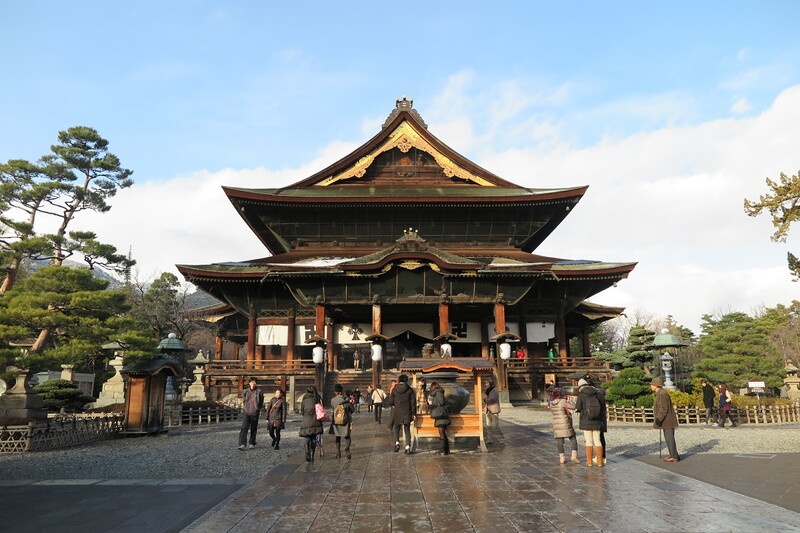 The main attractions are two sacred places, the Togakushi Shinto shrine and, above all, the Zenkoji Buddhist temple. One of the most famous and most visited temples in all of Japan, the only real tourist attraction in the city center of Nagano. This temple is famous for several reasons. 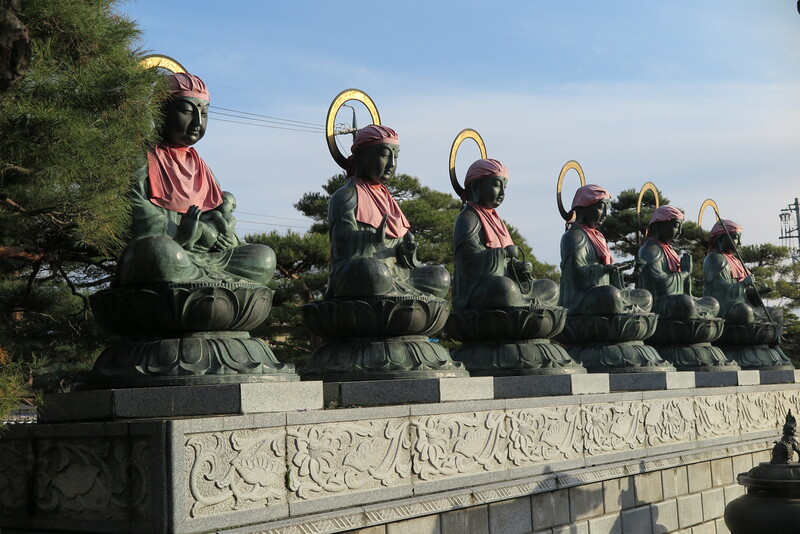 This is the largest temple of the entire eastern Japan, dating back to ancient times (it was founded in the seventh century), and keeps a statue of Buddha which is claimed to be the oldest Buddhist statue of Japan, it is assumed it came from India passing through Korea, in the year 552. This statue has been guarded by the monks of the temple for hundreds of years and it is absolutely forbidden to show it to strangers, so no one has ever seen it. Every six years, a copy of the statue is shown to visitors during a special event. The last time this event was held was in 2015, and the next time is therefore planned in 2021. The area within the temple grounds can be visited without paying any entrance fee, and there you can visit the main building, dating back to 1707. -the Pagoda Chureiden, behind the main building, which houses inside the Zenkoji History Museum, with numerous religious statues on exhibition. An exhibition space for different exhibitions changing over the months, the calendar is available only in Japanese at this link. It is a short walk from the Zenkoji temple, to the east. 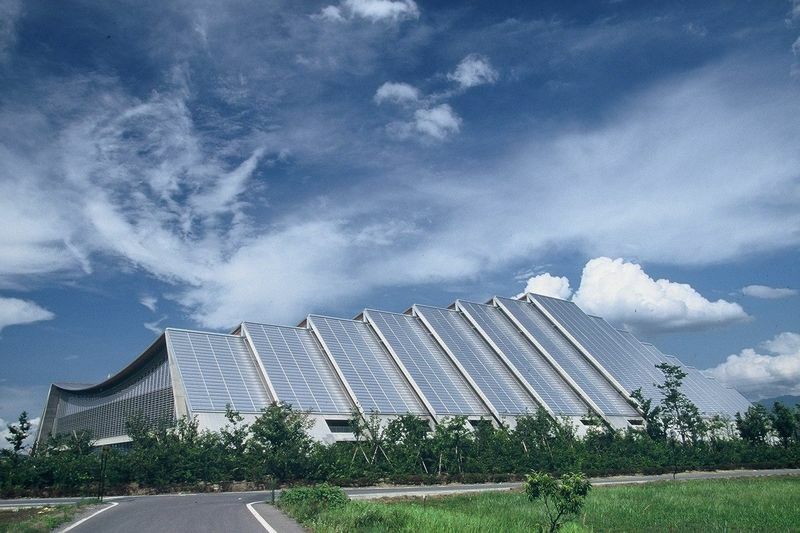 This art gallery is located right next to the Shinano Art Museum, and houses a large collection of paintings by the Japanese painter Kaii Higashiyama. From 7 to 22 February 1998 the city of Nagano hosted the eighteenth edition of the Winter Olympics. Among the remaining buildings to the city from these Olympics, the most important are the Olympic Stadium (currently a baseball field, it was used for the opening ceremony), the White Ring (that was used for ice skating) and especially the building called M-Wave. The name of this building derives from its external form, which appears to have the shape of a "M". During the Olympics it was used for speed skating events, and today is an ice skating rink open to the public during the winter, and it often hosts special events. Inside the building there is also a store of gadgets and souvenirs (open everyday) and the Nagano Olympics Exhibition Corner (free admission, 10-17, only on weekends and public holidays), a corner in memory of the memorable event involving the small town of Nagano, many photographs and objects related to the Olympics Games are on display here, including the original Olympic torch. The term Togakushi Shrine refers to a complex of Shinto shrines scattered in the forest at the foot of Mount Togakushi, within the Jōshin'etsu-kōgen National Park. The area is about one hour by bus from Nagano Station. 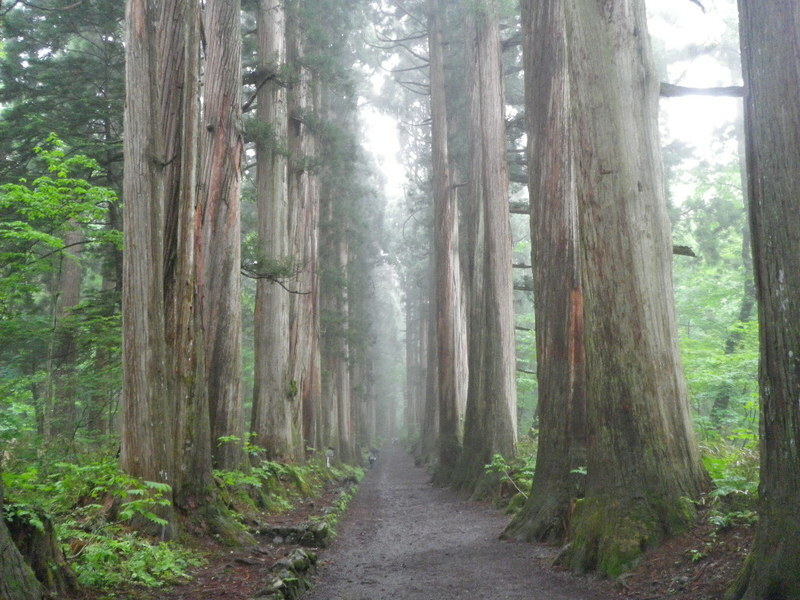 There are a total of five Shinto shrines, in three separate areas around 2 kilometers away from each other, connected by paths and stairs that go through the forest, in a very charming atmosphere, especially on the way to the highest shrine, called Okusha. In the maps you will find the three areas named as "lower shrine", "middle shrine" and "upper shrine". The area around the "middle shrine", It is an area full of restaurants, shops and ryokan. Literally "Folklore Museum of Togakushi", this museum is located near one of the three Shinto shrines of the mountain, the higher one, and is divided into two separate buildings. A first building dedicated to the daily lives of people during the Edo period, with many objects and instruments. A second building, called Togakure Ninpo Museum, is dedicated to the ninja world, with original objects and weapons, and other small curiosities, but the main attraction for visitors at the end is always the "Ninja House", a building full of traps and secret passages where you have to be able to get out. It is said that right in these mountains a famous school of ninjutsu, known as Togakure Ryu Ninpo, was founded in the twelfth century. Oyaki are a typical street food in the city of Nagano, you can find them for sale anywhere in the streets of the city. They are dumplings made with wheat flour and cooked on the grill, they can be filled with various things, usually vegetables such as eggplant, mushrooms or pumpkin. There is also a sweet version filled with sweet red bean paste (azuki). 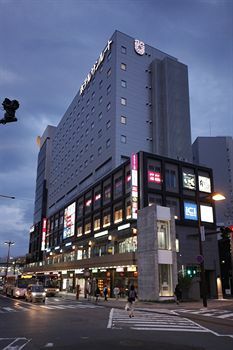 This hotel is located very close to Nagano station, the main station of the city served by shinkansen and several bus lines to the major attractions of the city. The hotel belongs to the reliable Japanese Sunroute hotel chain, which guarantees a high level of cleanliness and comfort and a good value. Single rooms on offer from ¥ 6,000 per night. 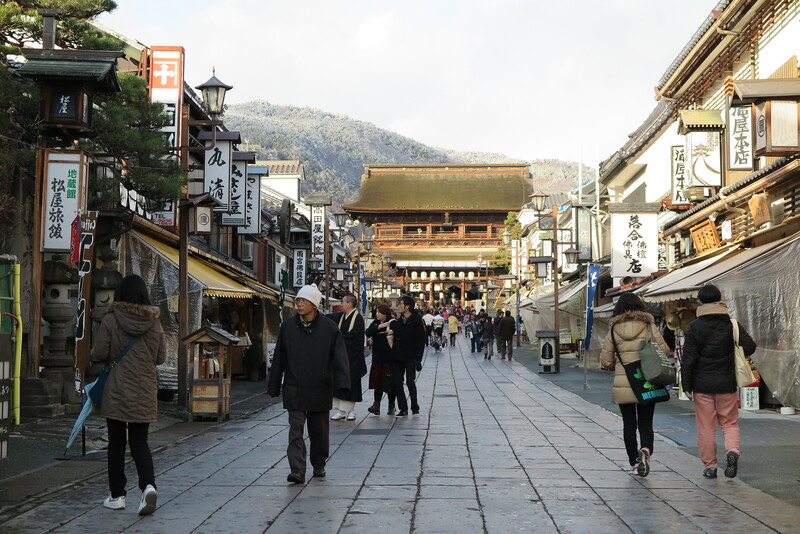 The most special experience you can do in Nagano, popular among the Japanese but virtually unknown among foreign tourists, is to sleep in one of the many rooms inside the Zenkoji Temple, located along the streets parallel to the Nakamise. Booking these rooms, if you have no knowledge of the Japanese language and you do not have any friends who can help you is almost impossible, since reservations can be made only by telephone. More information in this page in Japanese. Until recently it was possible to book one of these rooms through booking.com, but now when I'm writing this page it's no longer available. However, I leave the link in the event it is reactivated in the future: Shukubo Zenko-ji Temple Tokugyobo. The high-speed trains (shinkansen) called Asama connect Tokyo (Tokyo station or Ueno) and Nagano in about 100 minutes, 8000 yen one way. This is the only way to get to Nagano by train, via traditional lines the journey times are unacceptable (about 7 hours). If you haven't a Japan Rail Pass and 8000 yen each way are too much for your budget, the only alternative is the bus. Taking the bus is an undoubtedly slower solution (about 4 hours) but significantly cheaper to get to Nagano from Tokyo. The company Keio Bus offers 15 daily departures at the price of 4000 yen, 7200 yen round trip. More information here. The company Willer Express offers 13 daily departures with prices starting at 1,500 yen one way sometimes. More information here. The limited express trains called Shinano of JR connects Nagoya station and Nagano in about 3 hours for 7330 yen one way. If you come from other major cities west of of Nagoya (for example Osaka or Kyoto), the fastest solution is to get to Nagoya (see How to get to Nagoya), and once there take the Shinano limited express train. The company Meitetsu connects Nagoya and Nagano by bus in about 4 hours and a half with prices starting at 3600 yen. There is no online purchase service in English, you can get information or buy tickets directly at the Meitetsu Bus Center, located above the Meitetsu Nagoya station (a few meters south of the JR Nagoya station).